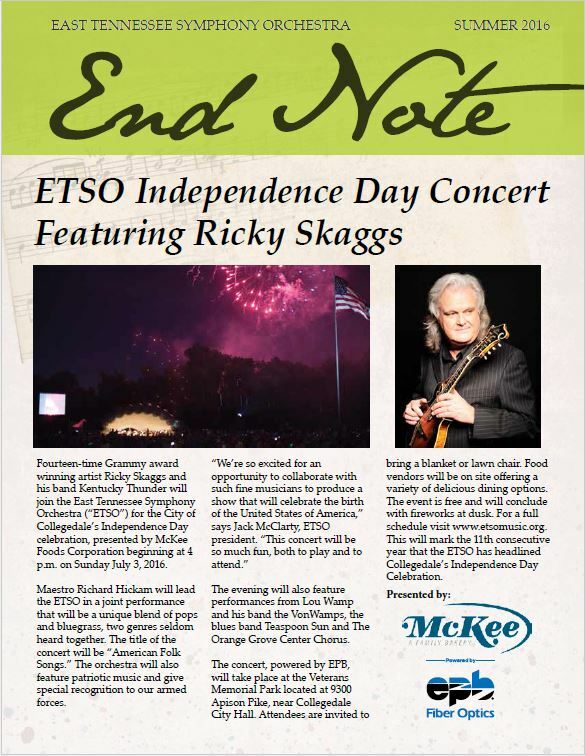 The ETSO will perform outdoor concerts in the heart of Collegedale, Tennessee along the Greenway path next to the Veterans Memorial Park (VMP). Accessible only by foot, the actual site is located along the Greenway Path across the street from the Collegedale Public Library. Interstate 24 East to Interstate 75 North, go toward Knoxville. Pull off at the Ooltewah Exit ( # 11). Turn right at the first traffic light onto Little Debbie Parkway. At the end of Little Debbie Parkway, turn left onto Apison Pike. The VMP is on your left approximately 300 yards down Apison Pike. Park on the right hand side of Apison Pike at the Public Library or at City Hall. Follow the “Greenway” walking path back under Apison Pike to the VMP site. Interstate 40 West / 75 South, follow to the I-40 / I-75 split. Go Interstate 75 South toward Chattanooga. Turn right at the second traffic light onto Little Debbie Parkway. Interstate 75 North to Chattanooga / Knoxville split. Go Interstate 75 North toward Knoxville. At the end of the Little Debbie Parkway, turn left onto Apison Pike. Are you interested in the ETSO? Do you want to know more about our upcoming events? Are you an organization wanting to connect? Please fill out the form below to get in touch with an ETSO member.